The industrial market for platinum is essentially a one trick pony and is thus vulnerable to outright replacement. That day has not yet arrived though and the market is presently been stressed by severe strikes in South Africa and by apparent rapid expansion of demand. Thus we have a two year window in which trading opportunities should arise through sheer volitional that would otherwise never be there. Otherwise there is no long term shortage to worry about. I do suspect that we do have a long term shortage in the gold market developing as global public demand expands steadily and will at least quadrupedal during the next forty years. No such force is seriously active in the Platinum market. As my readers know, I have excellent reason to think that the whole of the hydrocarbon paradigm is completely vulnerable to literally overnight replacement. That will decimate the industrial platinum market. Thus it is far wiser to stay in gold as can investment tool. Even investors who typically eschew precious metals have been hard-pressed to ignore the platinum industry this year. The longest strike in South African history paired with surging Asian demand is set to push the metal back into a physical deficit in 2014 – and could have repercussions for years to come. While gold remains the most conservative choice for saving, the “industrial precious metal” platinum is a compelling investment for those, like me, who are bullish on global net economic growth. As with gold and silver, examining platinum demand takes us to the Eastern hemisphere and China’s rapidly expanding economy. In particular, the growing Chinese middle class is generating massive demand for new automobiles, which in turn is consuming plenty of platinum. For the last ten years, autocatalysts have composed 40-50% of total global platinum demand. Autocatalysts use platinum to clean the emissions of motor vehicles, and 95% of the world’s new passenger cars come equipped with them. Both auto production and emissions standards are steadily increasing around the world, especially in the huge emerging market of China. 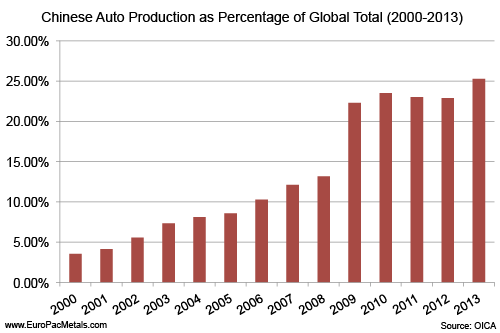 Global auto production grew 4% in 2013 to almost 89 million units. According to IHS, Inc., world auto sales will continue to grow to more than 100 million units by 2018 – that’s 12% growth in the next five years. And you can bet that growth won’t be coming from the US. China’s share of global vehicle production has exploded from under 4% in 2000 to an astounding 25% last year. I expect this demand to keep expanding as more Chinese citizens grow wealthier and are able to enter the auto market. Chinese vehicle production grew almost 15% in 2013 and should grow another 10% in 2014. New emissions standards that went into effect last year are already forcing Chinese auto manufacturers to use more platinum. Indeed, platinum use in Chinese autocatalysts increased 33% in 2013. I believe this trend will continue as the Chinese government tries to tackle the country’s critical pollution crisis. Just last week, the PRC announced that it would be removing 6 million vehicles from China’s roads by the end of the year because they no longer meet emissions standards. Though industrial applications have the largest impact on its price, platinum remains a sought-after precious metal with growing demand from the investment and jewelry sectors. Jewelry accounts for well over 25% of platinum demand, and that figure has been steadily increasing. Once again, we look east for the most compelling numbers. Chinese platinum jewelry demand represents about 65% of the world’s total and is expected to expand 5% this year. But India is the real bright point – high import tariffs imposed on gold by the Indian government in 2013 have created shortages and very high premiums on the yellow metal, driving consumers to replace gold with platinum. India’s platinum jewelry market has seen 30-50% growth every year so far this decade. 2014 should continue that trend with a 35% projected growth in platinum jewelry sales. While Eastern investors buy physical platinum in the form of jewelry, Westerners are piling into relatively young exchange-traded funds (ETFs) backed by the metal. Platinum ETFs did not exist until 2007, and the first South African-based platinum ETF began just last year. 2013 saw a 55% increase in the amount of physical platinum held by ETFs, totaling 2.5 million ounces. As short-term traders wake up to the same supply/demand issues summarized in this commentary, the trend of increasing retail investment may well absorb a greater share of the limited supply. Just as with gold and silver, I believe platinum ETFs are inferior to physical bullion for long-term investment. However, many investors prefer the liquidity they offer, and as a fundamental data point, they should not be ignored. With promising new sources of demand, platinum supplies have been under pressure. To put into perspective how little platinum is available, simply compare it to gold and silver. Over the past decade, about 13.5 times more gold and 100 times more silver have been mined than platinum. The vast majority of the meager platinum supply comes from just two countries – South Africa and Russia. Troubles in both of these countries are pushing supply constraints into a market shock. Beginning in January, more than 70,000 South African miners went on strike against the three largest platinum producers in the world – Anglo American Platinum, Impala Platinum, and Lonmin. This is the longest strike in South African history and is estimated to have already reduced global platinum production by 40%. About 1 million ounces of platinum will not be mined this year due to the strikes. No matter when these wage disputes are resolved, they’re going to have a deep impact on the platinum industry. Wages are already one of the biggest expenses of mining, and the Association of Mineworkers and Construction Union (AMCU) is demanding a doubling of wages by 2017. They’ve already rejected an offer of a 10% increase. This much seems clear: wages are going to go up and the industry will have to restructure its operations to handle the extra expense. The average global all-in cost of production (including capital expenditures and indirect overhead costs) is already at about $1,595 per ounce of platinum – 10% above the current market price. As the cost of business rises, some industry analysts are forecasting that Lonmin and perhaps other companies will be forced to keep some of their mines closed after the strikes end. This could affect the platinum market for many years into the future. Large mining operations cannot be started and stopped at the drop of a hat, and it may take a significant increase in the price per ounce to justify reopening any shuttered mines. Meanwhile, there’s the possibility that Russia’s annexation of Crimea could draw stricter economic sanctions from the United States and the European Union. How this would affect Russia’s giant mining industry is hard to tell, though it has already put a lot of upward pressure on the price of palladium, another important platinum group metal (PGM). Russia is the world’s largest producer of palladium and is widely suspected of having exhausted its official reserves of the metal. This rumor, combined with the news that Russia has been exporting abnormally large amounts of palladium to Switzerland in anticipation of economic sanctions, helped to drive the metal’s price to its highest since 2011 in May. The rising price of palladium and its ever-deepening physical deficit might even spur more producers to pay the extra for platinum, which can be more efficient than palladium in some autocatalysts. Generally, any limitations on Russian mining are bullish for all PGMs, and I am waiting for platinum to follow palladium’s spike. All told, Thomson Reuters GFMS is predicting at least a 700,000-ounce physical platinum deficit this year. It projects that platinum will pass $1,700 per ounce by the end of 2014, a 18% increase from today’s price. Johnson Matthey is even more pessimistic (or optimistic, from the point of view of a platinum investor), predicting a deficit of more than 1.2 million ounces – the largest since 1975. Even precious metals bears cannot deny the robust fundamentals for platinum this year. Investors who have already formed a bedrock for their portfolio with gold should consider adding physical platinum to increase future returns.